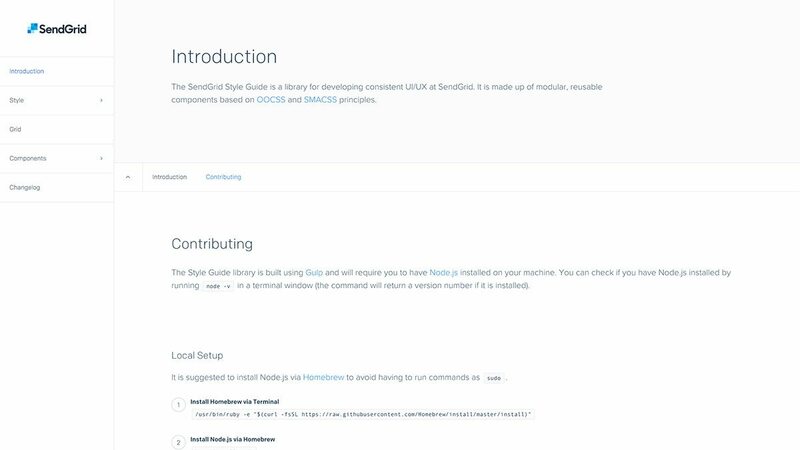 I’m proud to share our internal tool for designing and developing consistent experiences across our products: SendGrid’s official style guide. The project has been in the works for over a year now and we’ve had contributions from many team members across various teams. When we first set out to create our style guide, I had no idea how much work it was going to be. I thought we could just design our little hearts away on new buttons, colors, type, and various other UI components and then we’d push it live into SendGrid’s products. I couldn’t have been more wrong when it came to my expectation of how long this thing would take. In theory, it seemed like a fairly simple task. In reality, the design team was asking a lot from our engineers and also our product managers. Not only would these changes need to be designed, our team would need to prioritize them within their existing backlogs before they were built. Each component introduces its own set of complexities as well. Swapping out a color is a fairly straightforward change, but when I’m asking to change our table styles and the markup and classes that control them–well that’s a big undertaking. Before I go into how we got here and the things we’ve learned along the way, I want to quickly talk about the basics. A style guide (or pattern library) is a set of reusable user interface components that help create and build a consistent experience across a product or application. These components consist of many familiar elements such as buttons, text fields, tables, tooltips, grids, color palettes, typographic styles, icons, and more. It’s important to drive this consistency throughout your product because as we’ve learned, user’s impressions are formed quickly. Lindgaard observed that website impressions were reliably formed within 50 milliseconds, were reliably consistent between people, and were held consistent over time. And as usability.gov points out, we see that design plays a big role when it comes to perceptions of trust, and lack of trust can impact sales. When I started working at SendGrid, I quickly realized that we didn’t have an explicit set of rules to follow when working on new designs. Rules like how much space (padding or margin) a headline should have beneath it. Or, the hex color of gray we used for borders on various components (cards, dividers, or tables). Designers may have different personal preferences on whitespace and font sizes. Inconsistencies can also quickly lead to bulk in your stylesheets. An engineer may think you’ve intentionally chosen a different color for a button and add yet another button style when the designer was actually trying to be consistent, but just didn’t have the exact same hex color. Take time to craft a plan for how your components will be rolled out, and be prepared to pivot if your original plan doesn’t work out. Regularly meet with stakeholders to align on planning and execution. Test and experiment with your new components–you may find that they don’t always work as direct replacements for your current interface. Create component guidelines, semantically version your style guide, and provide a changelog for your engineers. Always ask yourself, is this component reusable? In the end, the goal of creating a style guide is to make everyone’s job easier when it comes to designing and developing user interfaces. You should do what’s best for your situation. Talk to your team members and see what makes the most sense for your product or app when creating your own style guide. Reach out to us on Twitter or Facebook if you would like to share lessons you’ve learned while creating a style guide or have questions for us!